Click “List of Virto SharePoint Gantts” link when you have configured desired data sources. Page with available Gantts will be opened. The page has links for navigating to data sources list, for editing/deleting configured Gantt and for adding new Gantt. 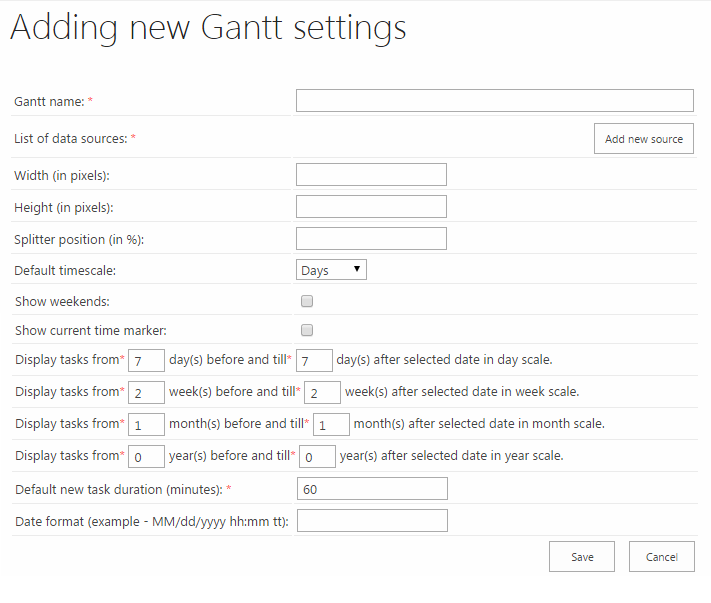 Click “Add new Gantt” for adding new Gantt view. Gantt adding page looks like this. Required fields are marked with “*” symbol. Fill in Gantt name. Then press button “Add new source” for adding at least one data source to Gantt. Each data source has its own options. 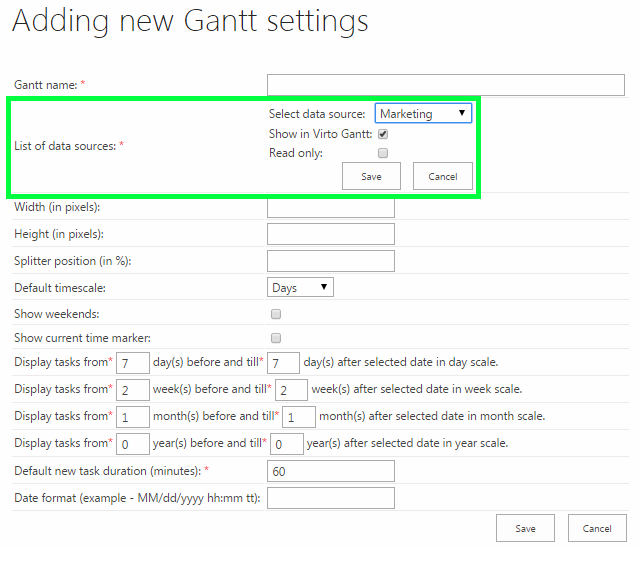 You can uncheck box “Show in Virto SharePoint Gantt“ and make data source not available for displaying (save without publishing). Also you can set data source on read only, i.e. user will not be able to create/modify tasks in Gantt Chart App for the data source. Press “Save” button to apply adjusted options to the data source and continue adjustment. Set width and/or height in pixels if you want to limit size of Virto Gantt Chart App displayed on site. Default height value is 800px, default width proportion is 100%. Set splitter position in percent (without “%” symbol). Splitter separates left Gantt table part from right graphical part. Choose default time scale (available values are days, weeks, months and year). Check option “Show weekend” if you want to display weekends in Gantt Chart App. Weekends are hidden by default. Check option “Show current time marker” if you want to see current time (as red vertical line) in Gantt Chart App. Set time range for displayed tasks. Default new task duration is 60 minutes. You can also define new default task duration. You can also predefine standard values for a Date format displaying. Date and Time will be displayed in left (table) part of the Gantt. Then press “Save” button and apply changes.